The human body produces about 1.5 liters of mucus (phlegm) every day. In a healthy person, the phlegm or mucus is almost clear in appearance and the quantity will be to its minimal level.When the mucus is in a yellowish color, and you are coughing, then it is due to or likely due to bacterial infection.The first symptom of bacterial infection is coughing and color change of mucus. The change of color in the mucus is the resistance action of the immune system against the infectious bacteria. To get rid of the issue, you have to consult a doctor and find out the reason and take treatment for it. For some immediate relief, people depend on homed remedies that are also found very useful. Flu and Cold are always a reason for causing cough and subsequently changes the color of mucus to yellow or greenish yellow. If you cough continuously, and the mucus color is changed then it is an indication to confirm that you are hit by cold or flu. People allergic to certain animals, pollen, dust or skin dander can develop frequent coughing. And as a result also, the color of mucus will change. Due to the bacterial and viral infections bronchitis can happen. During bronchitis, the infection will be a reason to create inflammation in the main air passages of the lungs, the bronchi, and this will lead to irritation and frequent cough. People are suffering from sore throat and fever also, will have cough followed by mucus color change. In both of the case, there will be severe or moderate coughing with a change in the color of mucus. The common home remedy by inhaling eucalyptus oil infused steam air can relieve the coughing. Sinuses are stagnant mucus that are filled with air develop inflammation due to infection of the air cavities within the passages of the nose. The blockage will be in fluid stage. Because of the heavy bacterial infection, the sinus infection can produce yellow mucus with a foul smell. Nasal irrigation and drinking plenty of water is a good remedy. Asthma occurs due to the inflammation and as a result, the patient will have breathing problem followed by frequent coughing. The coughing will produce yellow mucus produced by the inflammatory cells. Asthma infected people may have a long period of continued coughing, wheezing, breathing problem and chest congestion. Pneumonia infection attacks the lungs and produces inflammation in the air sacs. As a result, the air sacs in the lungs are filled with fluid or pus that will be discharged by way of frequent coughing with yellowish colored mucus. The infection may affect on both lungs. The patient will also have symptoms of heavy fever and respiratory issues. 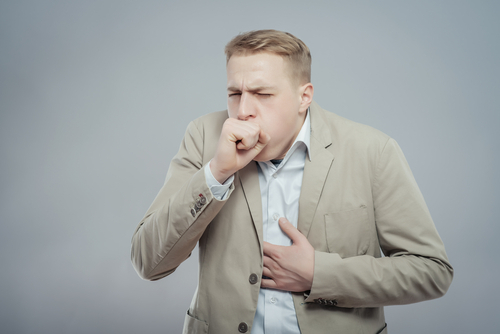 Heavy coughing with chest could be a possible reason for lung cancer. The mucus will be in thick yellowish color. If the symptom continues for two weeks without showing any subsidization tendency, then you must consult a doctor immediately. On an advanced stage, the mucus color will change to pinkish in nature and stains of blood. Drinking a mixture of two teaspoons of lemon juice with one teaspoon of honey in a cup of hot/warm water can give your good relief from coughing up with yellow mucus. Since lemon juice is rich in citric acid, it has the ability to break the mucus. Honey has a good property with a soothing ability that can take care of your sore throat. A mix of lemon tea blended with honey is also a good home remedy. Salt water gargling is a very common home remedy, and anybody can try at their home. Mix half teaspoon of salt with one cup of warm water and use for gargling. Repeat the process throughout the day several times can give you good result and relief from mucus. Warm liquids are always good to reduce the inflammation in the throat. It can also help to break the mucus and help to get discharged easily. Warm herbal tea or warm water made of horehound leaves or marshmallow and very much beneficial in reducing the inflammation and clear the respiratory tract and break the mucus. You can even try with hot chicken soup. Most of the expectorants are over the counter medicines. You don’t need a doctor’s prescription get an expectorant from the pharmacy. Expectorants can offer good relief to reduce the gravity of cough and production of mucus. However, excess consumption of expectorant is not good for health. Dairy products, smoking, and inhaling of chemicals must be avoided. All these are a reason for producing mucus and when the mucus is produced the body takes next course of action to discharge it out by way of coughing. Also, deep fried food also can produce excess mucus. So avoid these things and lead a healthy life. There could be so many reasons for coughing. But frequent cough and recurring cough need proper checking. If the following symptoms are disturbing you frequently, then it is better to take a medical opinion.